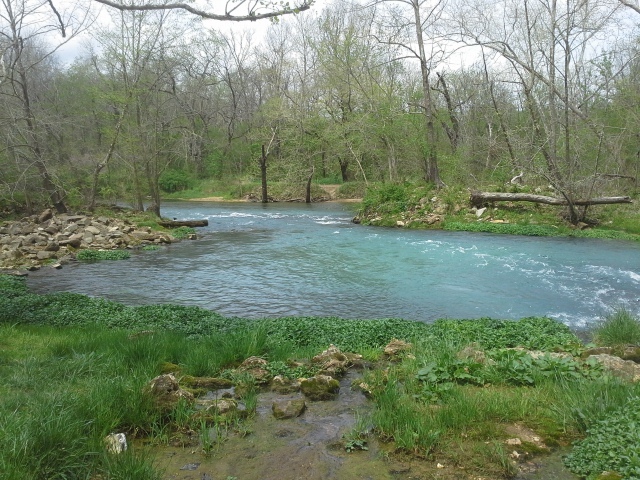 Down in the Ozark National Scenic Riverways there are a bunch of Springs. Water from the earth, flowing into the sunlight and filling the rivers as they run along their path. With each spring, rushing with their cold blue water, the depth of the rivers increases and the health of the waterway is replenished with the clean, life giving gallons exiting the earth. One such spring, about a hundred years ago, was seen as having the ability to heal people of their sickness as well. Welcome to Welch Spring. From the intersection of Highway 19 and Highway 106, take 19 north for about 27 miles, to Route KK. Make a right onto KK, toward Akers, for about 6 miles. 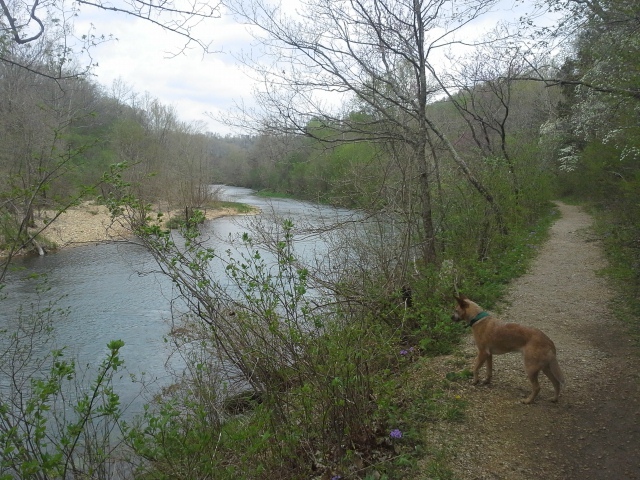 When you reach the Current River in Akers, make a right onto Route K, and take that up over the pass (stay on the road, but check out the incredible view) and into the woods for about 2 miles. 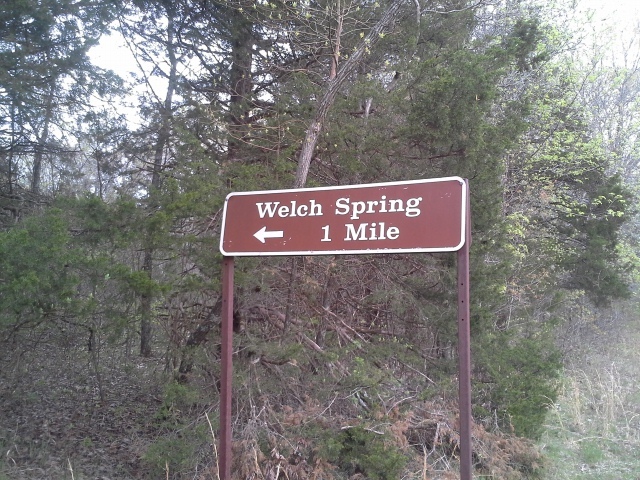 Around that 2 miles, on the lefthand side of the road will be the turnoff for Welch Spring. About a mile down the hill toward the river, after you pass a couple old abandoned buildings, is the parking lot for the Welch Spring trail down to the right. 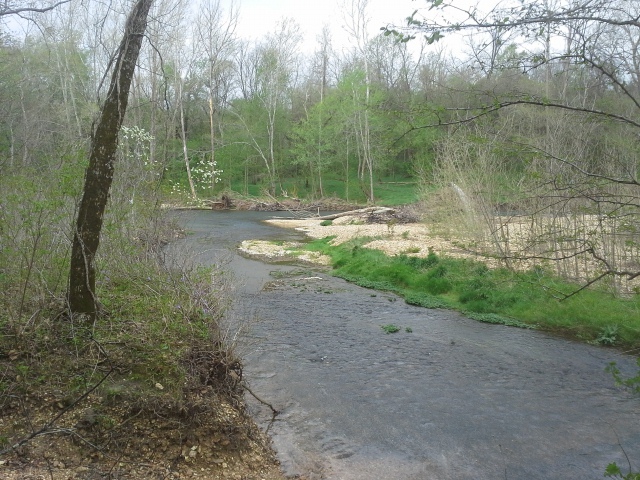 The trail itself is an easy half mile along the Current River for a bit, entering the forest, and then reemerging at the spring. It is gorgeous! 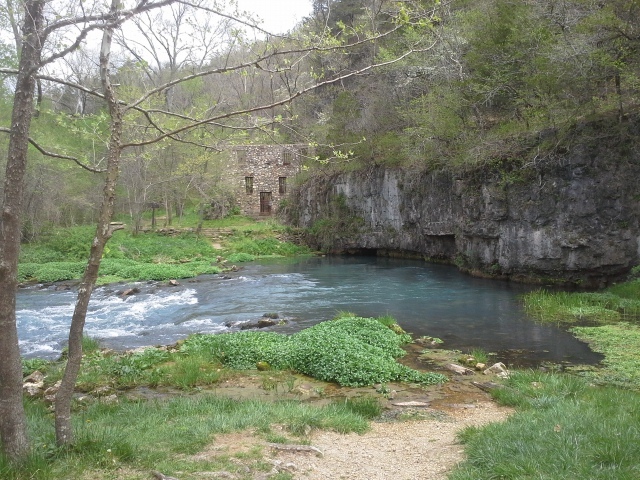 The water flowing out of the foot of the hill, flat and powerful, rushing to join the Current River is one of the reasons they call it the Ozark National SCENIC Riverways. Something about the liveliness of it as it propels sideways into the already moving current really creates a dynamic energy that can only be seen and felt by being there in person. 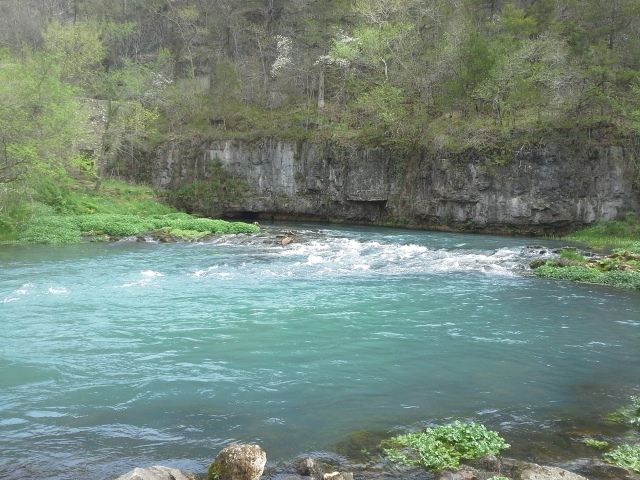 This confluence, with its chilled and green foliage, is a beautiful example of the power held in these springs. This is the site of Welch Hospital. Across the mouth of the spring on the other side, are the ruins of the old little hospital that was built by Dr. C.H. Diehl, back in 1913. He believed the air and water coming from the earth had healing properties, and he had the opening of the spring dammed so that it would force more of the air in the cave to enter the hospital. This little institution, against the deep hills of the Current River valley, was believed to be a place that a person suffering from “consumption” (Tuberculosis, Asthma, etc.) could be cured of their ailments. Turns out though that due to its remote location, Welch Hospital did not become the success that Dr. Diehl had been envisioning, and after his death in 1940 the grounds became neglected, eventually becoming the ruins that we see today. The trail claims to be half a mile (and it very likely is) but it seemed a bit longer than that. Or maybe I was just excited to get there to see it, and my impatience was showing. Like all springs, you should do your best to avoid getting in the water. Springs hold special elements of the surrounding ecosystem, due to the colder water, and everyone should be mindful to not disturb them. In line with not getting in the water, as far as I know, the only way to respectfully get to the ruins of the hospital is by taking a canoe (or your preferred mode of water travel) down the Current River, and get out on that side of the spring. I didn’t see any trails entering the area from that direction, so I guess you’re just gonna have to go on a float trip! Dr. Diehl believed that the water and air coming from the spring had a healing quality to it. That breathing it in, absorbing the essence of the earth as it exits from deep in the ground holds a key to our well being, and that it can improve our lives. As a person who sees and experiences a wealth of benefits when it comes to being in nature and cultivating your own personal connection to the earth and the forests and the rivers, I fully agree with him. 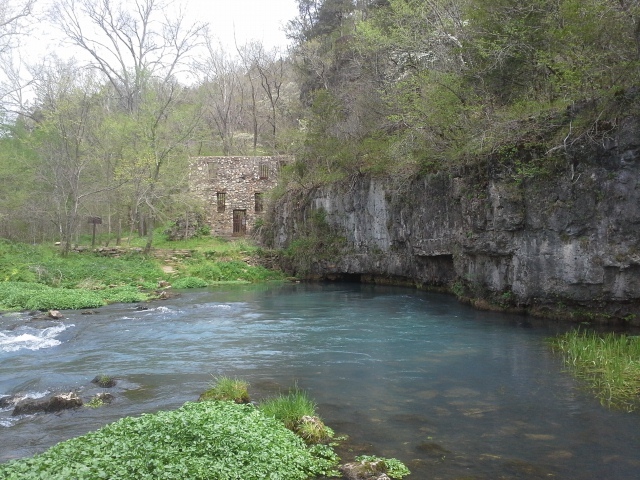 He was onto something, and I hope that the journey through the hills and down to the hospital along the river isn’t too remote for you, because you owe it to yourself to take a trip to Welch Spring.